Heat the oven to 400°F. Beat the egg and water in a small bowl with a fork or whisk. Place the dates into a medium bowl. Add the vinegar and toss to coat. Place the bacon onto a baking sheet. Bake for 25 minutes or until the bacon is cooked but not crisp, turning it over once after 20 minutes of baking time. Drain the bacon on paper towels. Sprinkle the flour on the work surface. Unfold 1 pastry sheet on the work surface. Brush the pastry sheet with the egg mixture. With the short side facing you, place 5 bacon strips crosswise onto the pastry sheet. Sprinkle with the half the cheese and top with half the date mixture. Starting at the short side, roll up like a jelly roll, brushing the pastry with the egg mixture as you roll. Repeat with the remaining pastry sheet. Using a sharp knife, carefully cut each pastry roll crosswise into 10 slices. Place the slices, cut-side up, onto 2 baking sheets. Brush the slices with the egg mixture. Divide the salad greens among 5 plates. Top each with 4 pastries. 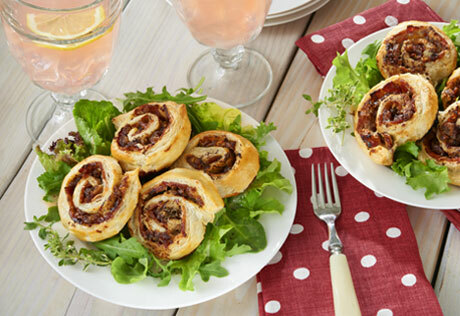 Make-Ahead: You can prepare the pinwheels up to 1 day in advance. Prepare as directed above but do not bake. Cover and refrigerate the unbaked pinwheels for up to 24 hours. Uncover and bake as directed above.